As San Francisco’s economy booms, a lot more people are commuting, and very few are doing it in a car. Between 2006 and 2014, the city saw a net growth of about 86,400 commuters, and 95 percent of them don’t drive, according to data from the US Census American Community Survey. 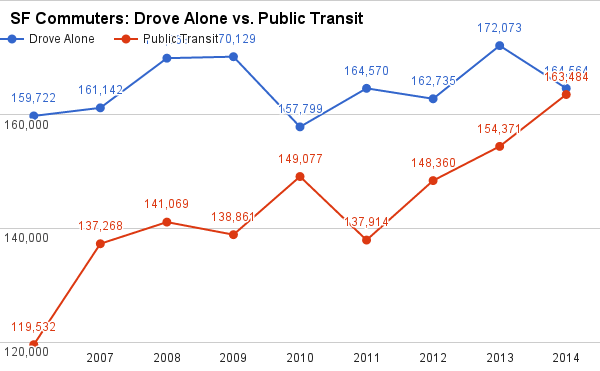 The ACS numbers provide the best available year-to-year data on commuting habits, though because of sampling error they are not absolutely precise. The numbers show a clear trend: Transit, walking, and bicycle commuting are each growing markedly faster than solo car commuting. Among SF residents, the number of transit commuters and solo drivers is now about equal — a significant gain for transit commuting since last year’s survey. Among all workers in the city, 40 percent now primarily take transit to work, surpassing solo driving (33 percent drive alone, and another 9 percent carpool). 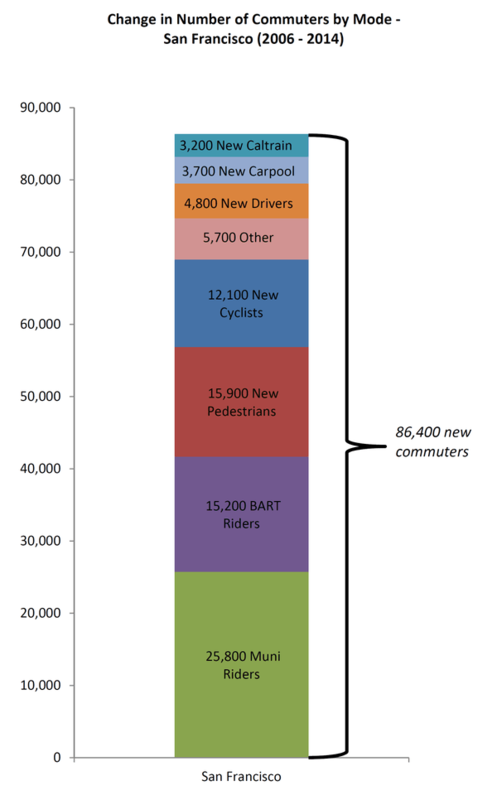 The new stats align with other recent findings about car use in SF. Last year, the ACS showed that between 2000 and 2012, 88 percent of the city’s net increase of 11,139 households were car-free. Studies done by SF’s local transportation agencies have shown that downtown car traffic is dropping despite the economic boom, and the majority of trips in SF have been made without a private automobile for at least three years. 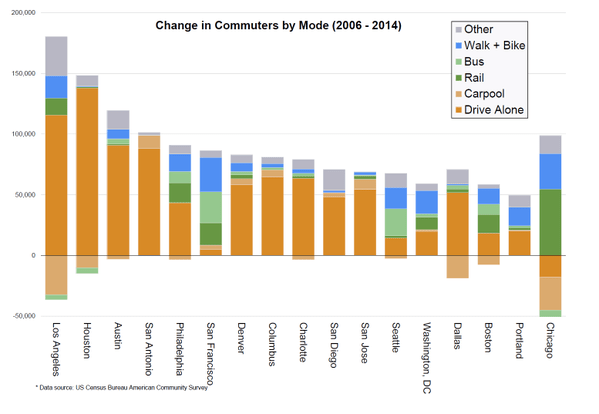 As we reported last month, the new ACS stats show that the share of commuting by car has recently declined in the Bay Area more than any other metropolitan area. Among peer cities in America, SF is one of the leaders in shifting commute travel from driving to other modes. In the chart below posted by Jamie Parks on Twitter, only Chicago, where the number of car commuters dropped, has seen driving account for a smaller share of the growth in commute travel. The Bay Area’s efforts to reduce driving and encourage walking, biking, and transit use are working. To continue to grow, the city needs to keep making progress. Well done, San Francisco! Drilling further into the data, there are some interesting tidbits. The ACS breaks out the data male/female. Women in SF drive alone to work much less than men–31% versus 37%. Women are less likely than men to walk (10.8% vs 11.6%) or bike (3% vs 5.6%) to work but are more likely to work at home (7.5% vs 6.5%) and much more likely to take public transit to work (37.9% vs 30.5%). Mean travel time to work is 31.7 minutes. 66% of San Franciscans’ commutes take less than 34 minutes. 30% of San Franciscans leave their home for work between 9am and noon. Just 2% leave for work between midnight and five am. these numbers are just hard to believe. If there is such a small increase in driving, then why is traffic so much worse than it was 3 yrs ago. Its really undeniable.when a persons commute time increases from 28-31 minutes to about 41-44 minutes for the exact same route, its not subjective. Maybe there are just more cars now trying to get onto 101 south because most at least half of the increase in commute time is getting from inner richmond to 101. getting across the city is hard and then the terrible OCtavia design has led to long backups. same with getting off and there is very noticeable increase on oak in the AM and Fell in the PM. The ongoing construction on gough hasnt really helped either. any information on increase in commutes south vs. those from the south coming into SF. The 101 freeway backup is significantly worse as well going south in the AM and north in PM, than it is coming into SF in the AM and going south in PM. In the figure posted here, does streetsblog combine biking and walking, or is that actually combined by ACS. It seems disingenous to combine these 2 modes, as walk increase is 2nd largest increase vs. cycling in 4th. the walk increase is probably mostly driven by the immense construction in north and central SOMA, very walkable to financial district. So a lot of that is building in proximity to jobs, which of course is a good thing. overall this looks nice. i dont want an increase in driving either, because i am forced to commute based on where job is and where i one my home. That’s the problem with solo car travel, we’ve long had saturation of the streets, so the very small increase has a much greater affect. This is exactly the reason, congestion doesn’t scale linearly with volume. The survey is among SF residents. There must be more people driving in from elsewhere. As noted, the giant increase from in Uber/Lyft drivers always circulating has got to be contributing to congestion. The numbers refer to all commutes to jobs within the city, or what the Census calls “geographic workplace,” except for figures we note are “among SF residents.” Feel free to click on the links in the article for more details. So, is the “among SF residents” limited to SF residents who also work within San Francisco city limits? If so, that really skews the data against Caltrain, shuttle buses, and private automobiles… and increasingly BART to Oakland, so I understand. And Uber/Lyft drivers giving rides might not be counted as riding solo. Those stats are for workers 16 and over. Among SF households, about 31 percent are still car-free. Might be the most fascinating take I’ve seen on all the swirling changes around SF today: I guess the primary challenge is to sustain the positive aspects of these trends so they don’t slip back due to overcrowding. Considering seven huge regional transit projects due to open in five years (2 Muni BRT lines, Muni Central Subway, BART to San Jose, Caltrain electrification, SMART, Transbay Terminal) it seems viable… but less so when recognizing that only one of these is slated to open in the next two years.